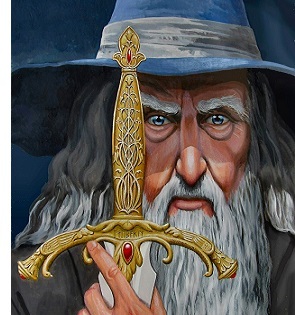 Glamdring - It was the sword of Turgon, founder of Gondolin, although it played a much greater role in the Third Age, under its new owner, Gandalf the Grey. After the fall of Gondolin, it passed out of knowledge until it was discovered among a trolls' hoard in the Trollshaws between Weathertop and Rivendell. It was found alongside its twin sword, Orcrist the "Goblin-cleaver".